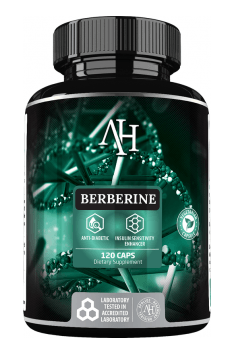 Apollo’s Hegemony Berberine is a dietary supplement containing 300 mg of the purest berberine in one capsule in the form of hydrochloride. The supplement demonstrates a range of beneficial properties towards the functioning of the whole organism. The main are: decreasing the level of sugar in blood, increasing insulin sensitivity of tissues, reducing cholesterol level and leveling up lipid profile, improving effort abilities and intensifying lipolysis. Berberine is an alkaloid which may be obtained from various plants used in Chinese traditional medicine, where it is presented as a kind of golden mean which has a salutary influence on the organism. Currently, studies confirm a surprisingly wide range of benefits from the supplementation with berberine. Its principal mechanism of operation is the activation of kinase AMPK and inhibition of tyrosine-protein phosphatase type 1B. In order to fully realize the consequences berberine supplementation brings, one should understand what AMPK is and what functions it fulfills in the human organism. AMPK, i.e. kinase activated by AMP is a protein in cells responsible for monitoring and regulating the energy state of cells. In natural conditions, metabolic stress is expressed by accelerated utilization of ATP to ADP and AMP by losing subsequent phosphate remnants. Adenosine monophosphate, the last product of ATP breakdown is a factor stimulating the activity of AMPK (hence its name). In this way, the organism is informed about the increased energy needs of cells and responds with a cascade of reactions caused also by the activity of AMPK, the aim of which is balancing homeostasis of the organism. All the systems of energy extraction are then activated, i.e. acceleration of glucose uptake from blood (by increased insulin sensitivity and insulin secretion), increased pace of lipolysis and glycolysis and more effective uptake and oxidation of fatty acids. Due to the fact that AMPK is activated in the states of the increased energy expenditure of the system, it is logical that its activation will be caused by physical effort. Berberine allows to increase the activity of this kinase, regardless of the type of activity. In this way, it introduces the organism in the state that could be called “chronic training”. During regular supplementation with berberine, AMPK is constantly being activated, causing the state of artificially increased need for energy in the organism. Activated AMPK, aiming at ensuring cells with the proper amount of ATP, mobilizes all energy processes the organism has at its disposal. As a result of this, the pace of lipolysis, i.e. the breakdown of triglycerides in fatty tissue is increased and similarly the pace of the uptake of lipolysis products and free fatty acids is accelerated. Their oxidation is also stimulated by active AMPK, providing in this way the full pathway of direct burning of fatty tissue. AMPK supports people who try to lose weight also on the pathway of carbohydrate transformations, which are also a significant obstacle in fatty tissue reduction. Active form of kinase causes increased secretion of insulin and increased sensitivity of insulin receptors, which in turn causes faster pace of sugar uptake from blood. Importantly, AMPK influences mainly GLUT-4 receptors, responsible for transporting glucose molecules to muscles, therefore tissues, which are able to store and utilize this material, which is also reflected in increased training possibilities. Lowering glucose level in blood is also reflected in the health of the cardiovascular system. As a result of supplementation with berberine, the level of protein glycation is lowered, i.e. the main factor responsible for the appearance of atherosclerosis and many other micro- and macroangiopathies. Berberine is also an inhibitor of proprotein convertase subtilisin/kexin type 9 (PCSK9). Its activity in the organism consists in the breakdown of the receptors of low-density lipoprotein, colloquially called “bad cholesterol”, leading to its excessively high concentration in peripheral blood. Limiting the activity of PCSK9 by berberine in clinical studies gave the effect in the form of lower total cholesterol and the improvement of the LDL to HDL ratio. Studies show the improvement of mood and the ability to focus and maintain attention in people supplementing berberine. Although this is not conclusive, current scientific papers indicate that mood elevation is influenced by the high efficiency of the systems providing energy, stimulated by active AMPK. Thanks to this, berberine is recommended as antidepressant therapy supplementation. The influence of berberine on the organism by inhibiting tyrosine-protein phosphatase 1B is also worth attention. It is a factor distorting the activity of the insulin-leptin system, the main obesity factor. Limiting the activity of PTP1B in clinical studies caused body mass reduction and better tolerance of carbohydrates by the organism. Summing up, Apollo’s Hegemony Berberine is an incredibly comprehensive supplement with considerable potential. It effect was well-proved in the study, which showed identical effects of diabetes type II therapy with 1500 mg of berberine and 1500 mg of a popular pharmaceutical, commonly used in the treatment of insulin-resistance – metformin. However, it should be borne in mind that regulating carbohydrate metabolism is only one of the many mechanisms of operation of this supplement. It will also facilitate all other energy processes, considerably supporting fatty tissue reduction and also it will positively influence the health of the cardiovascular system. Take 900-1,500 mg a day, that is 1-2 capsules taken 3 times. Research demonstrates that 1,500 mg of berberine taken in three doses is as efficient as 1,500 mg of metformin or 4 mg of glibenclamide, two drugs used for treating type II diabetes. Take capsules with or shortly after a meal, as that is when glucose and lipid spikes occur. Do not take too much berberine at once, as it can result in cramping, diarrhoea, an upset stomach; it should always be taken throughout the day. Because berberine easily reacts with other substances, consult a doctor if you take any medication. Although berberine demonstrates phenomenal effect both in people who try to lose weight and those with glucose-insulin balance problems, it is advised to use the preparation with caution during the period of building muscle mass by healthy and physically active people. Studies show that provoking constant activity of AMPK may decrease the pace of muscle mass growth. Bearing this in mind, in the periods of building muscle mass, it is rather recommended to limit the application of the supplement only to high-carbohydrate meals. Capsule shell, rice, filling substance. Berberine – an isoquinoline alkaloid naturally appearing i.a. in common barberry (Berberis vulgaris). Berberine is a substance which has been known for hundreds years, which is attributed strong anti-inflammatory, antioxidant, anticancer, antibacterial (especially when it comes to Gram-positive bacteria), antiviral, antifungal and anti-protozoan properties. This compound regulates proper functioning of the cardiovascular system. Numerous clinical studies on the activity of berberine confirm its hypoglycemic properties - it decreases the increased glucose level in blood and normalizes lipid profile - influences decreasing the concentration of LDL, total cholesterol and triacylglycerols and increases the level of HDL in blood, i.a. thanks to supporting liver work. There are some studies confirming positive influence of berberine on alleviating the symptoms of polycystic ovary syndrome (PCOS) and acne. This substance also positively influences cognitive functions. Berberine may decrease the production of glucose in the liver and influence the improvement of tissue sensitivity to insulin. For this reason, supplements with berberine are reccomended as support in the therapy of insulin-resistance, diabetes, metabolic syndrome, excess weight and obesity. Berberine is also the component of dietary supplements supporting weight loss. With the simultaneous application of medicines, be careful, as berberine may interact with some pharmacologically active substances.